ELKHART – Tensions between the City of Elkhart and the Elkhart Volunteer Fire Department (EVFD) have been smoldering for quite some time and they caught fire during an Elkhart City Council meeting held on Tuesday, April 18. In the first of a multi-part series, the meeting itself will be addressed in part one while the public comments along with EVFD Fire Chief Randy McCoy’s response will be covered in subsequent editions. 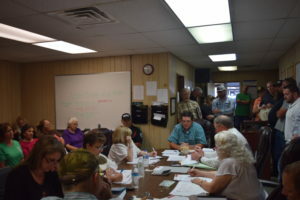 Following the public comments portion of the meeting, which will be covered in a separate article in a later edition of this newspaper, the meeting got underway. After covering three items on the council agenda, Mayor Mike Gordon addressed the ongoing issues from between the City of Elkhart and the EVFD. “Yesterday, we had an open forum. We got together with some civic leaders and persons of interest to talk about this problem. I presented a proposal. It was my idea and I am pulling this proposal. I am retracting it for the simple reason because the city has to complete its budget before we do anything. There is money involved in this and we have to see what we can do with or budget. It is the same thing with the proposal the Elkhart Fire Department gave to us. We have to see where our budget is,” the mayor said. The council had voted to give the EVFD 60 days to vacate their current location and the city would sever all ties with the EVFD in May. Several of the councilmembers commented on the matter. Mayor Pro Tem Billy Jack Wright spoke first. “We have spent a lot of time going over and through the city’s business. I think all of you deserve the answers. The city council was addressed by Fire Chief McCoy back in January. Mr. McCoy came to the city council meeting to protest the 413 287S residence that was on the agenda,” Wright said. He explained the council was not going to recognize the address as a fire department substation because the residence is listed as McCoy’s residence. “In that meeting, Mr. McCoy said the VFD didn’t have to put out any fires in the City of Elkhart or in Anderson County without a contract. Mr. McCoy sat on this very council and the contract has not been in force since 2009. All the taxpayers need to know what is going on but Mr. McCoy made it very clear he didn’t have to put out these fires. That made it very clear to me there was animosity between him and the city council,” Wright said. Wright continued and alleged while serving on the council, McCoy, former mayor Raymond Dunlap and four other council members created a training site on a site closed by the Texas Commission on Environmental Quality. He added McCoy profited off this site for several years while sitting on the council. He also said McCoy, former mayor Dunlap and previous councilmembers created an ordinance which would allow the fire chief at that time (Jim Bob Parker) or assistant fire chief (McCoy) charge residents of the city a fee for putting out a fire. McCoy, present at the meeting, asked for a chance to respond to the allegations. but Gordon informed him he would not be allowed to and if he had wanted to, he should have either signed up to speak during the public forum or have requested to be put on the agenda. The next councilmember to speak was Beverly Anderson. “I asked Randy to provide a statement of finances (for the EVFD) but he told me I would have to go through Jim Bob for that. Again, I don’t know how that works but I think if they were getting money from the city, we should have been provided at least a quarterly financial report. I’m not complaining about the money you received, I just want to know what you did with it,” she said. When the matter was put to a vote, a motion to rescind the March 21 motion to evict the EVFD was approved by a margin of 4-1. A motion to allow the present business arrangement to continue until Sept. 30 was also approved by a margin of 4-1. Wright cast the dissenting vote in both matters. 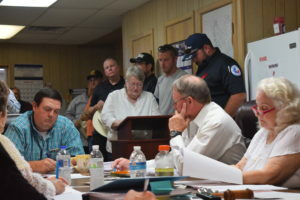 Prior to the discussion about city’s relationship with the EVFD, the first item brought before the council concerned the installation of a water line at a residence located at 2107 Hwy. 294 West in Elkhart. Sheridan said he had requested this to be placed on the meeting agenda and had invited previous council members to attend the Tuesday night meeting in order to discuss the matter. “I invited previous council members and staff to be here to discuss this but all of them declined to be here, with the exception of one who gave a brief statement. I don’t think there is really anything here we can discuss,” the councilman said. “It concerns a water line that was put in without permission to the tune of about $10,000. It is a big concern for me and that is about $10,000 that could have gone to the fire department. We don’t seem to be concerned about the all these losses and mistakes made by the (previous) city councils. I just got a reply last night that there would be no one here to discuss it,” he said. The mayor pro tem also voiced his concerns over the matter. “When this was discovered the outside supervisor gave his resignation. The (Anderson County) sheriff’s department was contacted to take a statement about what had actually gone on here and it was turned over to an investigator. I know I was never questioned about,” the mayor pro tem said. He added two other employees involved in the matter were never questioned. When the matter was brought to Anderson County District Attorney Allyson Mitchell, she informed the matter had been no-billed because of a lack of evidence. “These things are very concerning to me because this was a $10,000 theft from the city. If there are no consequences, I guess we are sitting wide open for these things to happen again,” Wright said. The council approved sending Michael Edwards to take a test for his basic class D water license. The council approved sending Seth Hollingsworth to take a test for his basic class D wastewater license. An agenda item concerning sealed bids for two vehicles and a stove was tabled for further discussion. Next articleHORACE MCQUEEN: Words Of Wisdom—or something else!